Good morning! 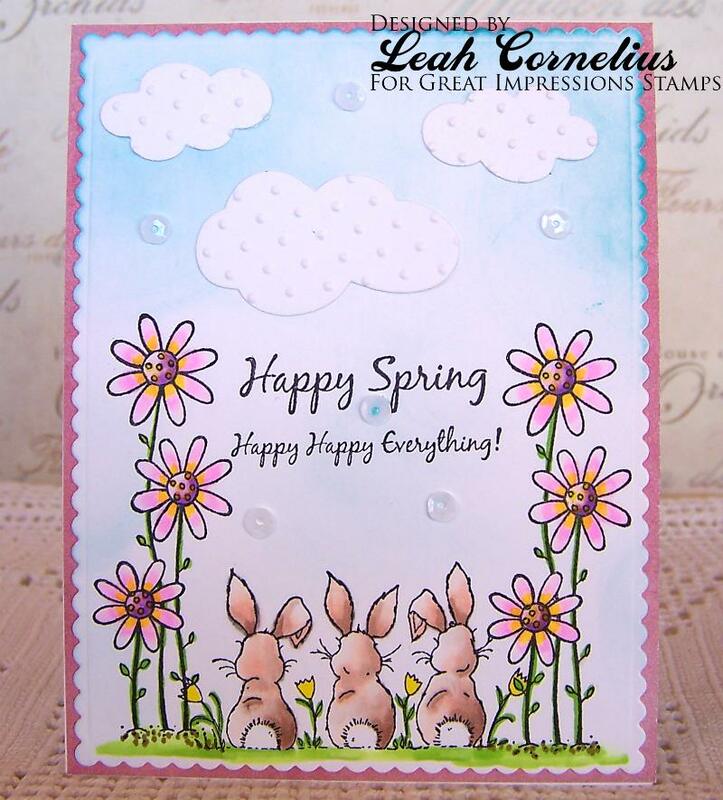 Today I'm sharing a lovely Spring card featuring stamps from Great Impressions Stamps. 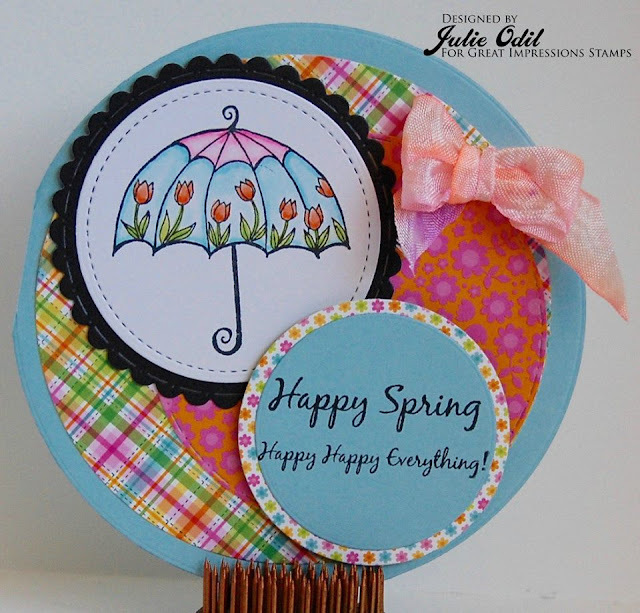 Today's card features the lovely Happy Spring Squares (G415). I stamped the image with Memento Tuxedo Black Ink. Copic Markers were used to color the squares, and then I cut them out. I embossed some white cardstock with Cuttlebug Swiss Dots, tied on some yellow ribbon, and added it to my Lemon Whip card with 3D Foam Tape. I then added the squares to my design with 3D Foam Tape. The final step was to add White Opal Liquid Pearls to the center of each flower. You only have 1-more day to join our February Sketch Challenge. 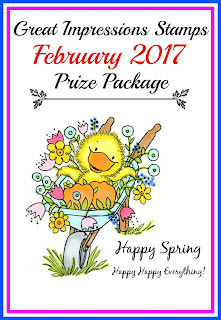 I hope you'll take some time to join in the FUN for a chance to win an awesome prize, and for a chance to be our Guest Designer in April. Good morning! Today we are taking another look at all of the beautiful cards that our Guest Designer Angie shared with us this month. First up is the gorgeous card that Angie made for our February Sketch Challenge. I love how she colored the image, and her black and white background draws your eyes the the image. Next, Angie created a cool background for her beautifully colored image, and the sign she used is a perfect match. Angie's final card is this adorable Baby Card. I fell in love with her baby card ... from her coloring, to the beautiful design paper she used. It has been a pleasure having Angie share her projects with us this month. She used our February Challenge Sketch for all of her projects, and they turned out beautifully! You still have time to join in our Great Impressions February Challenge Sketch! Hop on over for all of the details and join in the FUN! Good morning! This week we are Revisiting Spring Projects that were created by various Designers. 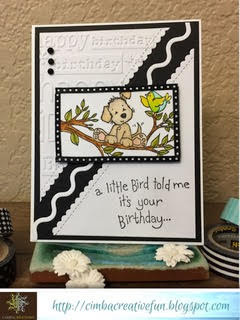 Today's card was created by Mynn and features the adorable Potted Puppy (F582) and Buzzing By Sentiment (A147) available at Great Impressions Stamps. 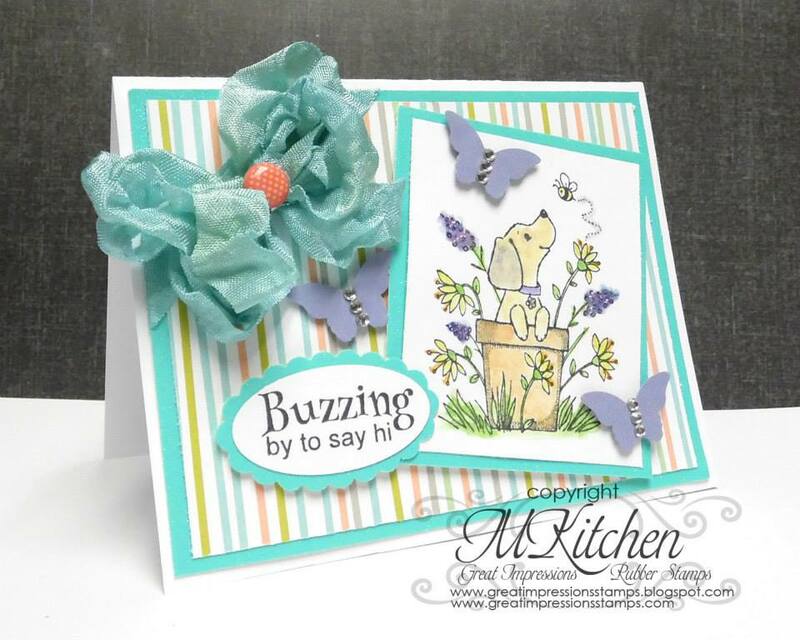 I love the pastel color pallet along with Mynn's coloring of the image, and her layout beautifully features the stamps she used! The Design Team will be back on Monday to inspire you with lots of beautiful projects. 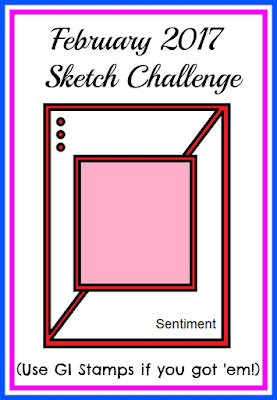 Until then, there is still plenty of time to join our February Sketch Challenge. It's a lovely sketch and very versatile. Stop by for all of the details, and then join in the FUN! Good morning! This week we are Revisiting Spring Projects that were created by various Designers. 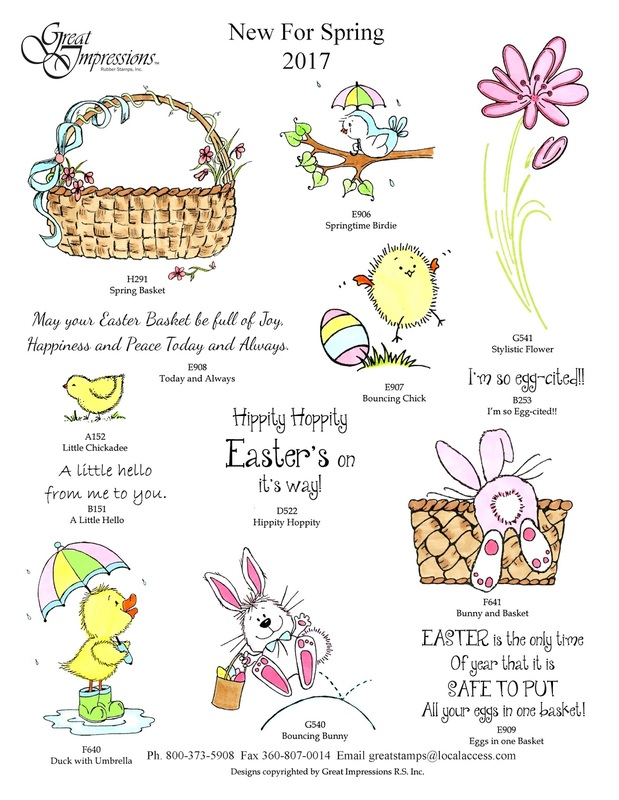 Today's card was created by Leah and features the adorable Bunny Backs (E749), Growing Tall Flowers (F358) and Happy Everything Sentiment (B246) which you will find in the Great Impressions StampsStore. This scene that Leah made with the stamps is positively lovely! Leah did an amazing job creating this Spring card. 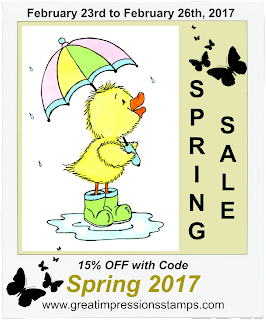 Speaking of Spring, did you see the New Spring Stamps and the Sale that starts today? Check out the Great Impressions Newsletter for all of the details! Good morning! This week we are Revisiting Spring Projects that were created by various Designers. Today's card was created by Kendra and features the adorable Louise with Ducklings (H283), Just Ducky Sentiment (E889) and Hello Louie (E856) available at Great Impressions Stamps. 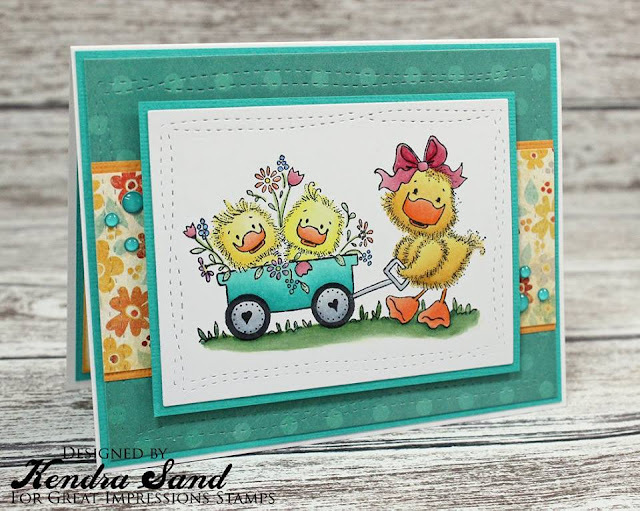 I absolutely love how Kendra colored Louise and her Ducklings, and the design is so bright and cheerful. Kendra continued the design on the inside of her card with Louie and the sentiment. This is one card I would really enjoy receiving in the mail. Good morning! This week we are Revisiting Spring Projects that were created by various Designers. Why Spring you ask? Well, we've been have Spring-like weather here in Northern Illinois - like 60-degrees. 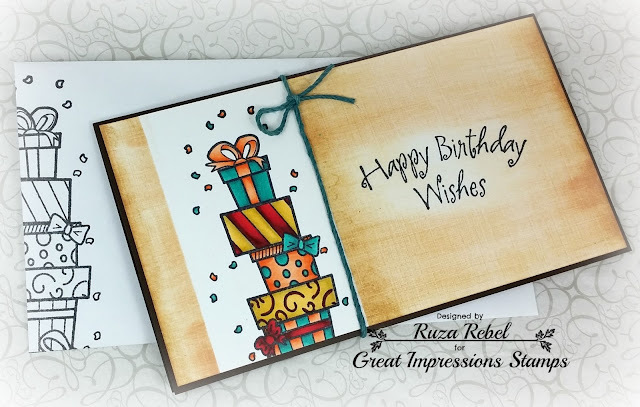 Today's card was created by Ruza and features the lovely G364 Spring Special Thanks available at Great Impressions Stamps. The colors are perfect for Spring, and Ruza did a beautiful job coloring the flowers. Good morning all. 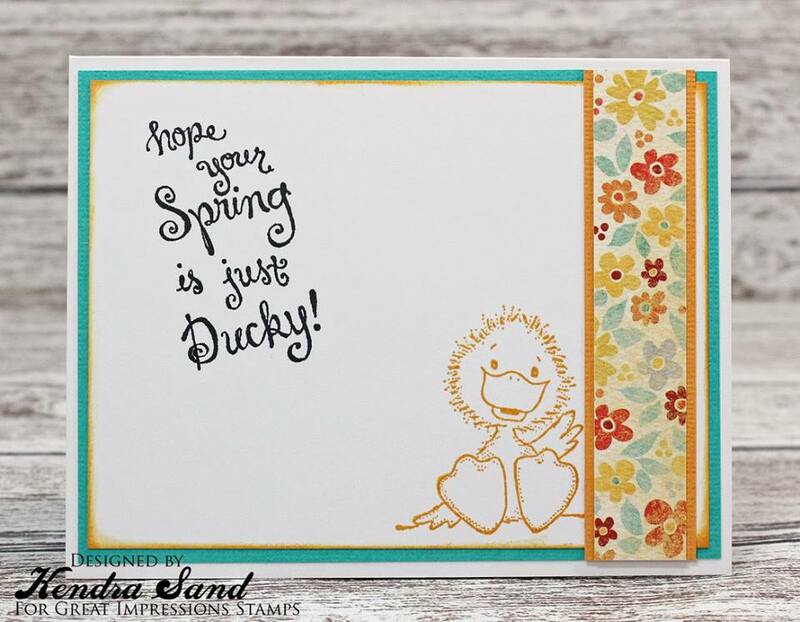 Our February Guest Designer Angie is joining us today with an adorable baby card. I’m here again today with my final guest post for the month. 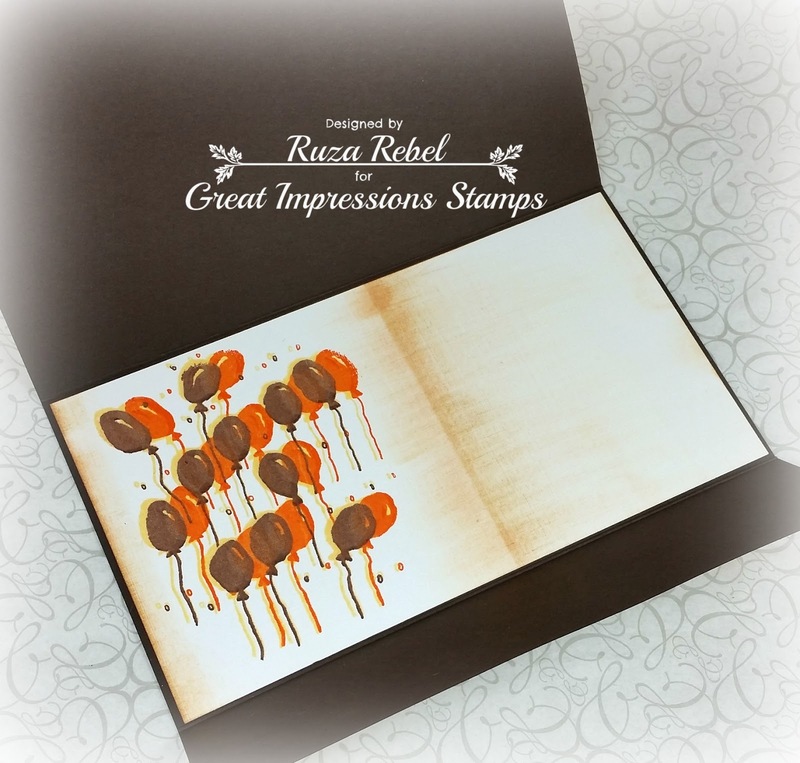 Thanks again for inviting me, I’ve had so much fun playing with Great Impressions stamps! This card was made with white and blue card stock and plaid patterned paper. 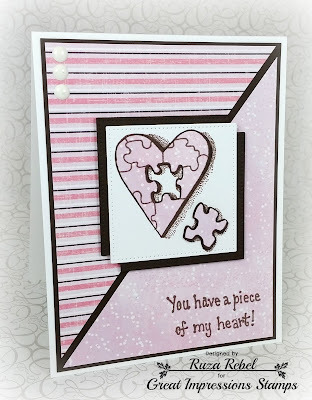 I used several dies to cut out the pieces including a pinked edge die and some scallop edge dies to create the vertical stripe from the sketch. 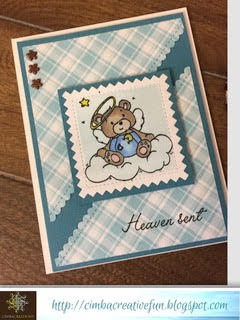 The Angel Bear (F526) is colored with markers and is combined with the Heaven Sent Sentiment (B221). Both the blue panels are popped up on fun foam for dimension. The 3 pretty copper flowers are actually brads from my stash. I hope you will find the time to join the fun this month with the February sketch challenge! Thanks to Great Impressions for a fun month of guest designing! Such an adorable card! I love the how Angie colored the bear, and the DP she used is perfect for the image and our Sketch! Make sure you stop by Angie's Blog and leave her some love. Our Great Impressions February Challenge is live! Hop on over for all of the details, and join in the FUN! 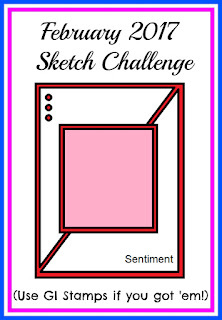 We are now just over half-way through our sketch challenge. There is still plenty of time to enter. This is the card I made for the challenge. I just love this stamp. 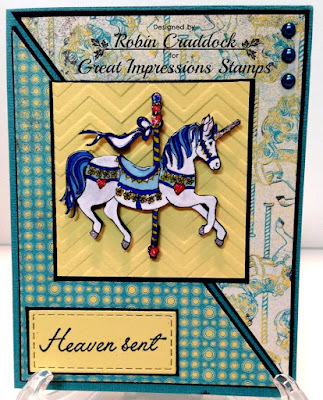 It's called "Carousel Horse" (G339) and I have paired it with the sentiment "Heaven Sent" (B221). On the inside I have added the sentiment "New Little Baby" (C434). It's a wonderful sentiment to add for a baby card. My niece is about to have a little boy so I have baby on the brain...LOL. I would love to see you join in the Great Impressions February Challenge. As you can see I have flipped the sketch. 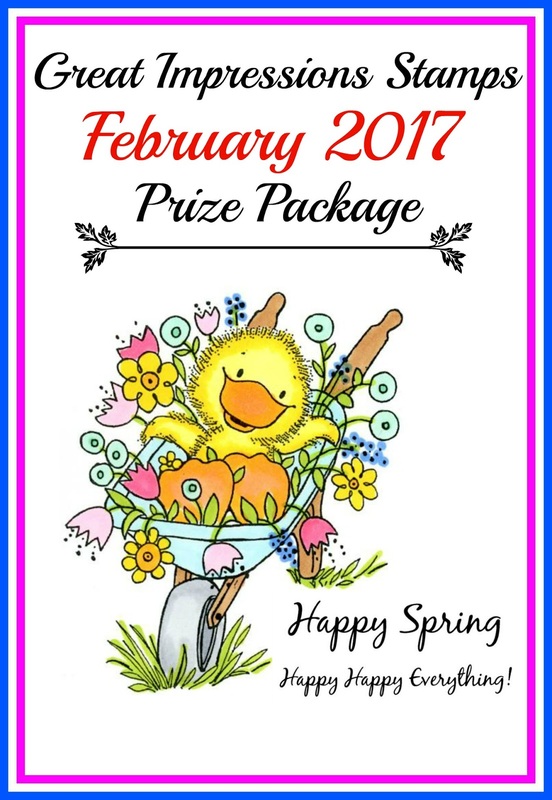 This is the prize you can win. It's so adorable! Hope you have had a wonderful month so far and enjoyed much happiness on Valentine's Day! Good morning! 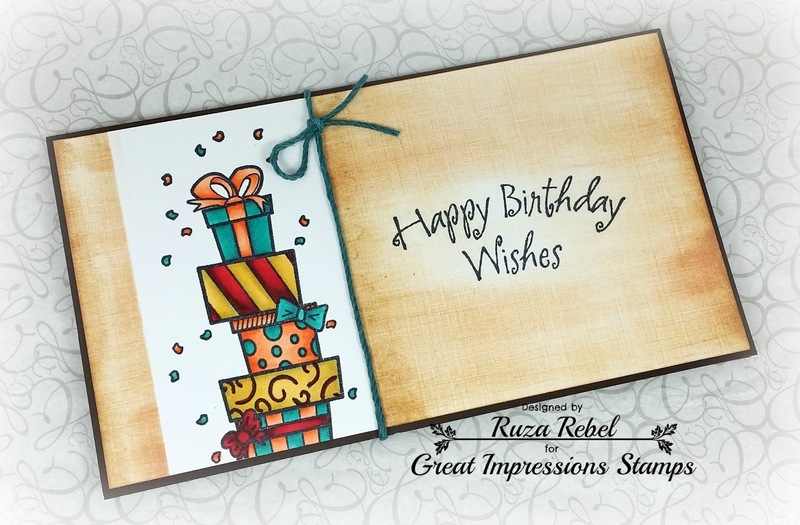 Today I'm sharing a Birthday card featuring stamps from Great Impressions Stamps. I wanted to create a Birthday card to put money inside. To start I took a 6-1/2" x 8-1/2" piece of cardstock, scored the long side at 3-1/2" and 7", folded it and put it on the side. Next I cut a panel for the cover, stamped the Stacked Presents (H178) with Memento Tuxedo Black Ink, and colored the image with my Copic Markers. I then stamped the Wishes Sentiment (D361), masked off the Stacked Presents, and used a dauber to apply a variety of Tim Holtz Distress Ink around the image and sentiment. I then cut out 2 more panels. The first panel is for the cover of the inside flap of the card. I stamped the Sparkles Sentiment (F312) with Memento Tuxedo Black Ink, and applied distress ink to match the cover. For the second panel I stamped the Fun Balloons, which is a Retired GI Stamp, in three different colors. I added distress ink after masking the image leaving room to write a personal note inside. Here's a picture of the card partially open. I then added the Stacked Presents to the envelope to coordinate with my card, used twine that matches one of the presents to tie the card closed. It slips off and on very easily for easy access to the inside. Our Great Impressions February Sketch Challenge is up and running, and I hope you'll take some time to join in the FUN for a chance to win an awesome prize, and for a chance to be our Guest Designer in April. Good morning all. Our February Guest Designer Angie is joining us today with an awesome card. Thanks again for inviting me to guest design this month! For this card I used this fun Gone Camping (G537) and the Do More Sentiment (C496) on the inside of the card. I stamp the tire track diagonally to match the sketch, then matted it on black and kraft card stock. I colored the image with watercolor markers and a water brush and then mounted it on foam along with a “Road Trip” sticker from my stash. The bling is actually 3 sequins filled with black Enamel Accents. Lastly I added a tiny twine bow. Check out the sketch and come join the fun and enter this month’s challenge! Such an cool card! 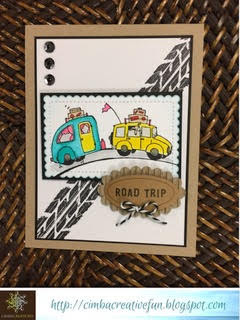 I love the how Angie used our Sketch for her card, and the Road Trip sticker is a perfect match for the image! 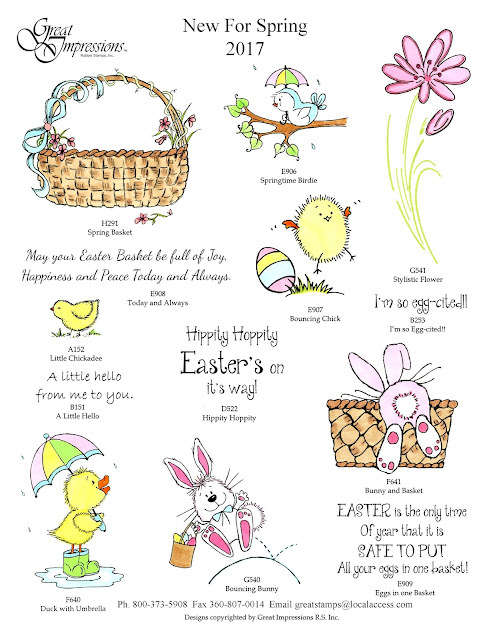 Make sure you stop by Angie's Blog to see the inside of the card, and don't forget to leave her some love. We are having such a wonderful month and hoping you are too! Robin here to show you another card I have created for your inspiration. Since I reversed the sketch I thought I would do it again. This time I am using Spring Special Thanks (G364) paired with some bright floral papers. I am so ready to warm up some. This hasn't been a hard winter but I am a bit tired of being cold. 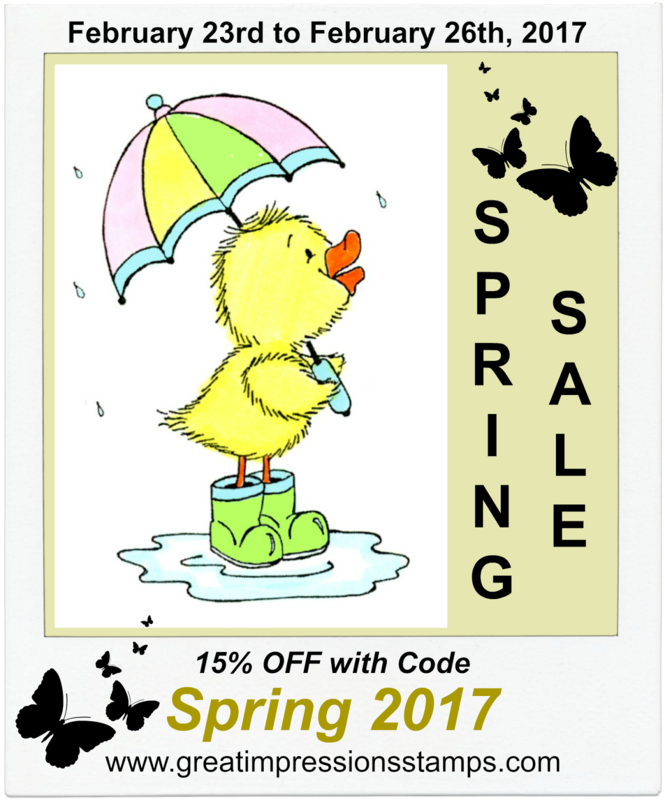 I thought this would be a nice way to look forward to Spring since the ground hog saw his shadow. I have colored with my Copics and then added some gloss to the flowers and used sparkle on the words. Since the sentiment is included I thought some flowers and ribbon were in order. Then I found this cute floral button in my stash to top it off. I really love this sketch and hope you all will join in on the February Great Impressions Sketch Challenge! Can't wait to see what you create!! Good morning! 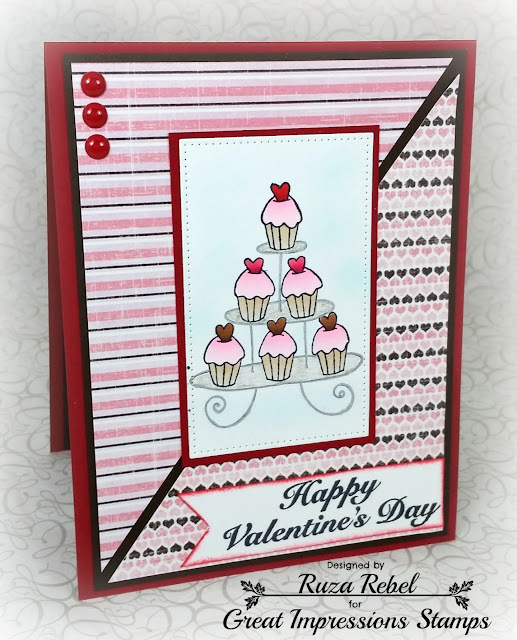 Today I'm sharing a Valentine's Day card featuring the Cupcakes with Hearts (F601) along with the Happy Valentine' Day Sentiment (E437) from Great Impressions Stamps. I stamped the Cupcakes with Hearts using Memento Tuxedo Black Ink on white cardstock, colored the cupcakes with my Copic Markers, used a Clear Star Gelly Roll Pen for the 3-tiers/glass shelves, and used a silver pen to go over the iron frame. I cut out the colored image with my Pierced Rectangle Die and put it on a red mat. 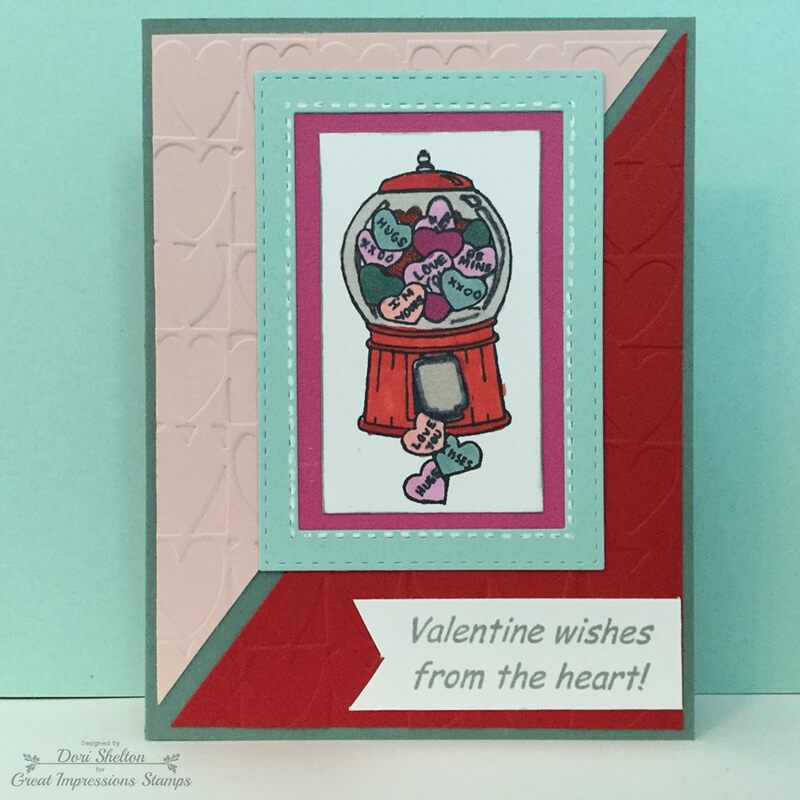 Using our current Challenge Sketch (see below) I created the background using brown cardstock and design paper which I layered on a red card base. I cut the Valentine's Day sentiment into 2-pieces and stamped it with Memento Tuxedo Black Ink on white cardstock, cut it down to create the tag, and applied red distress ink around the edges. Final step was to add the panel, sentiment and enamel dots to the background I created. Come play along with our Great Impressions February Sketch Challenge for a chance to win an awesome prize, and for a chance to be our Guest Designer in April. Good morning! Welcome to another monthly Challenge here at Great Impressions! This month we have a "Sketch Challenge" for you to try your hand at. please make sure we can see the sketch in your project. Let's give a BIG Welcome to our Guest Designer Angie. 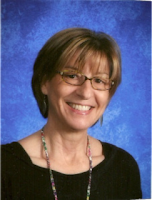 Angie will be sharing her creations during the Month of February with all of us. I’m so excited to be guest designing with Great Impressions this month! I’m a semi-retired music teacher living with my sweet husband and our senior English Springer Spaniel. We also have 4 grown children and 5 beautiful grandchildren. After I retired, I opened an Etsy store selling music related crafts. I like many crafts but card making is the one I enjoy the most. It gives me such joy to make and share handmade cards with family and friends. Thanks so much to Great Impressions for letting me share my creations with you! Now let's see what Angie created to inspire you! Angie did an amazing job using our sketch, and her coloring and texture makes an awesome card. 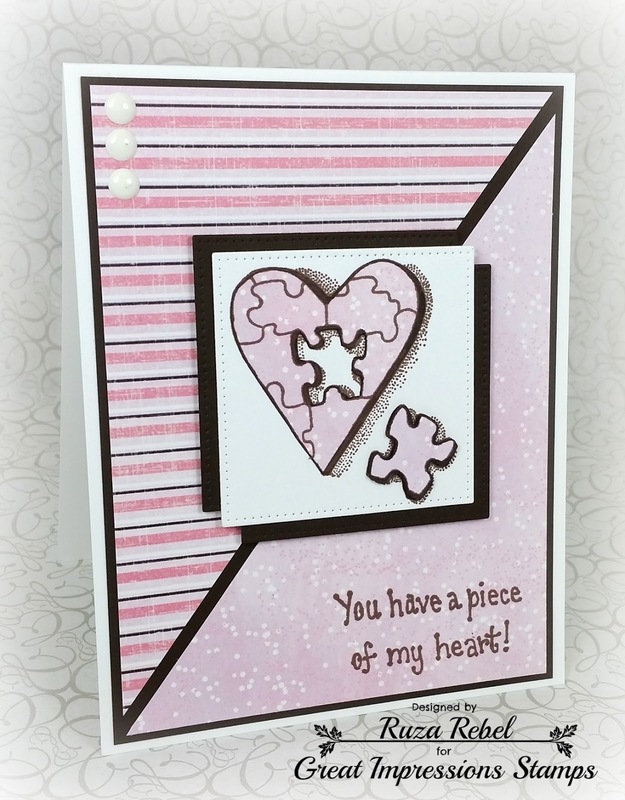 Make sure you head over to Angie's Blog to see how she split up the sentiment and put part of it on the inside of her card. Don't forget to leave her some love while you are there. Robin here to share another card with you. I am using Sea Turtles (G335). I colored the turtles with my Copics and added some Glastique. I did a second of the larger turtle and fussy cut him out then popped him up on the other one. I added several leaves to look like plants growing and give it more of an underwater look. The sentiment was done on my computer. I also used some water themed embossing folders and finally a whale charm. This card is for an adorable little boy who loves sea turtles. I am his nanny. He and his twin sister will be turning 10 years old. I will be back another day with a card for her. We have a new challenge starting in two days. Remember it's the first Sunday of the month so that means Feb 5! Don't forget to stop by and check it out. I hope you will join in the February challenge as we love to see what everyone is doing.